How Much Does Mouse Pest Control Cost? Although mice are abundant in residential homes throughout New Jersey and Pennsylvania, they are also one of the most elusive. Mice are nocturnal and travel along wall lines, making them hard to spot. You can tell if you have mice by finding the evidence they leave behind such as droppings. Mice are small and require a lot of food to provide energy, thus creating a large number of droppings where they are active. 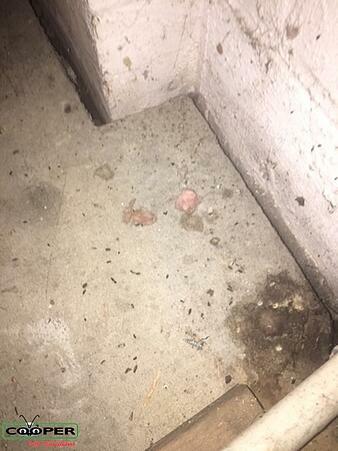 The photo of droppings above was taken by one of our staff members in a basement infested with mice. As you can see, droppings look like small, blackish brown grains of rice. Mice have oily bodies. If they are frequently traveling in and out of a single hole, they leave behind a mark as pictured above. 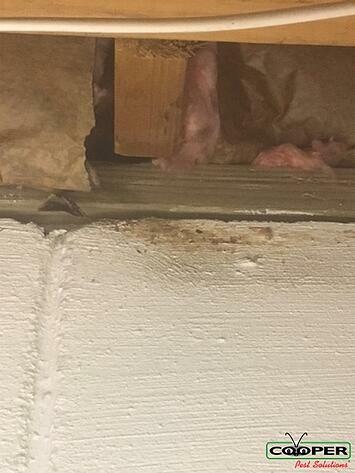 The wall around the exposed insulation in this basement is providing an entry point for mouse activity. The brown mark on the white wall is indicative of this. How does an exterminator get rid of mice in my home? A mouse infestation is not something to be taken lightly since mice and rodents carry diseases that can be harmful to humans. If left uncontrolled, they will also chew throughout your home, further endangering your families health. After mice enter your home, they can be extremely difficult to get rid of since they often live in hidden areas within garages, attics, lofts, and wall interiors which is why store bought solutions often fall short when compared to Cooper's service. Since the expert technicians at Cooper know all about rodent biology and behavior, we know how mice travel and exactly where to place our baits to eliminate mice from your home. Bait stations are strategically placed in discrete areas where mice activity is most abundant in your home. The bait stations can only be opened by a technician’s key and are tamper resistant, making it very difficult for pets and children to open. Common areas for bait station placement include garages, basements, and under stationary kitchen appliances. If you are not comfortable with the placement of a bait station, please let the technician know. We will never place a bait station in a location that you don’t feel comfortable with. What is the average price for mouse control? 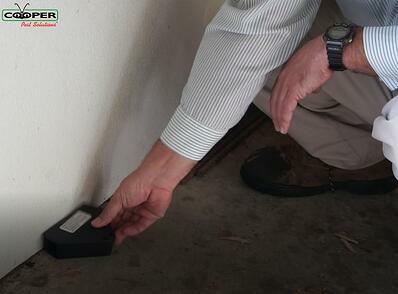 This is a common question that homeowners are looking for when searching for mouse control. Several factors contribute to the price of services when it comes to pest control such as the cost of materials and the cost of the technician’s physical services. 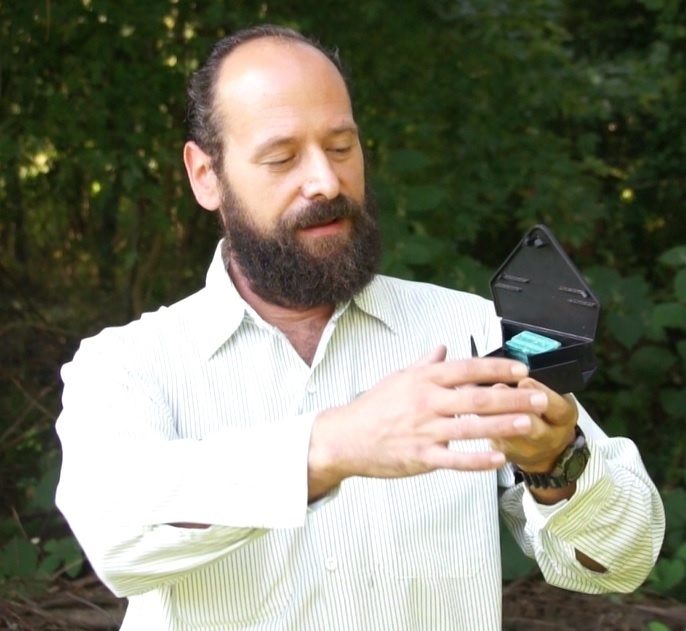 Some companies may be less expensive or more expensive depending on if they use baiting stations versus traditional snap traps, which vary is cost for the pest control company. At Cooper, we provide a 90 Day Mouse Control Program for $250 plus tax. We settled on this price due to the cost of bait stations and the cost of technician services to inspect, place, and maintain the elements of the program. With our mouse service, you are also covered by a 100% guarantee and as many technician visits as you need within the 90 day period. You will find less expensive or more expensive services on the market, but you need to be careful and critical about why the services are priced the way they are. How can I tell if I am being charged too much? What should I ask a pest control company before buying a mouse service? Pest control companies and local exterminators treat residential mouse infestations with different strategies. In order to understand what the specific programs offer, make sure you ask the following questions. What are you looking for in the initial inspection? Common signs of mouse activity include finding droppings, entry points, and rub marks. How are you going to get rid of the mice in my home? Most companies will either use bait stations, snap traps, or a combination of the two, as well as sealing entry points around the foundation of your home. How long will it take for the mice to be gone? A reputable pest control company will tell you that they will work until the problem is resolved. Technicians should have a minimum of a Pesticide Applicator License verified by the state in which they are performing service. How can Cooper control the mice in my home? Cooper Pest Solutions provides three programs that target mouse control for residential homeowners. Cooper’s One Time Mouse Program is a reactive service that actively takes care of the current mouse population in your home for 90 days. After scheduling through our online portal, our customer service department will promptly reach out to you to confirm the technician dispatch date that you requested. Same day or next day service is typically available. One of Cooper’s state-certified technicians will visit your home to analyze your home and strategically place bait our tamper-resistant bait stations accordingly. As part of the 90 Day Mouse Program, you are entitled to an unlimited amount of technician visits within the 90 day period of your coverage. One simple call to our customer service department will result in a technician visit to help solve your mouse problem. This is not a preventative service for homeowners who do not have an existing mouse infestation. If you do not currently have mice at your home but want to prevent them from coming in the future, read about our Home Plans below. The Intensive Service Plan is designed to provide preventive pest and rodent control for your home, year round. The service plan includes four preventive services per year. Each service is unique and will be accompanied by a detailed 30-point inspection report with detailed findings as well as providing you with important recommendations for your home. Each year you will receive three exterior maintenance services (March – November) and one interior service (December – February). The winter service will focus on the interior of the structure and is geared towards rodents and other pests that may live within the structure. The Traditional Service Plan is substantial value for the homeowner that does not want to be bothered by crawling insects, mice, and wasps. The Traditional Service Plan provides preventive pest and rodent control for your home, year round. As part of your plan, you will receive four services per year. Each year you will receive three exterior maintenance services (March – November) and one interior service (December – February). There are some exclusions in the Traditional Service Plan when compared to the Intensive Service Plan. *The Home Traditional Plan does not provide exclusion work to seal the holes on the exterior of your home. 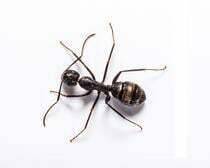 All of our pest control services are 100% guaranteed. If you are interested in learning more about our Home Plans, fill out the form on this page or call us at 1-800-949-2667.